In colonial days, shutters were only made of wood and were designed for closing during stormy weather. For the modern house, vinyl shutters provide a lightweight and cost-effective way to add curb appeal to your house. Vinyl shutters are typically not functional; instead, they are used on house designs like traditional or saltbox to bring attention to the windows. The color of the shutters will complement or contrast with the color of the house. Over time, though, the color may fade on vinyl shutters exposed to sunlight. Painting the shutters can restore their initial beauty. Shutters may be used to frame a window. Clean the shutters. Use the garden hose at full force to blast off spider webs and grime. If the shutters are secured with screws, the shutters can be removed to clean and paint. If leaving the shutters attached to the house during the painting process and there are plantings beneath the window, wet the soil around the plants to help dilute any paint or cleaning products that drip. Covering the plantings with a canvas or plastic tarp can further protect them. When finished, wet the soil again to further dilute any dripped products. Mix warm water, about two tablespoons of a grime-cutting dish detergent, and about 1/2 to 1 cup chlorine bleach in a bucket of water. An "oxygen" bleach product can be substituted for chlorine bleach. Bleach helps to remove mildew; if no mildew is present, eliminate the bleach. Wearing rubber gloves, use a scrub brush to thoroughly clean the shutters. Rinse immediately and allow to air dry. Sand the shutters to rough up the surface for better primer adhesion. Use a fine, 150- to 180-grit sandpaper. Apply an exterior latex urethane primer according to the manufacturer's instruction. Primer prepares the surface for painting. Latex urethane primer is best suited to adapt to the expanding and contracting nature of vinyl. If applying spray primer, tape newspaper to the surrounding surfaces for protection. If possible, prime and paint the shutters on an overcast day so the vinyl will not be hot from the sun. Apply latex urethane paint according to the manufacturer's instructions after the priming has thoroughly dried. Two or more coats of paint may be needed. Allow the paint to dry between coats. Reinstall the shutters or remove newspaper protecting the walls. Wear goggles when using the garden hose full force to clean the shutters. 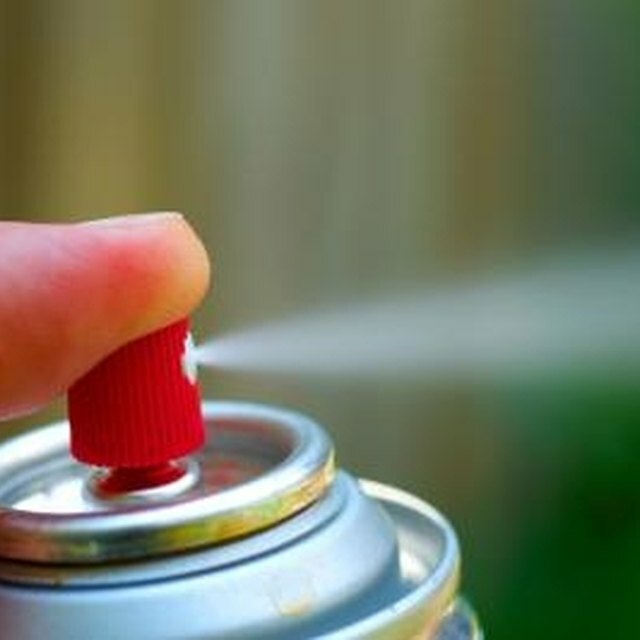 When using spray paint, wear a mask to avoid inhaling the paint. If removing shutters to paint indoors, like in a garage, be sure to open a window or the garage door for ventilation. Barbara Raskauskas's favorite pursuits are home improvement, landscape design, organic gardening and blogging. Her Internet writing appears on SASS Magazine, AT&T and various other websites. Raskauskas is active in the small business she and her husband have owned since 2000 and is a former MS Office instructor.